When Pope Francis canonizes Blessed Teresa of Kolkata on Sept. 4, he won't simply be fulfilling a special duty of his office, he will be honoring a woman he has called "a symbol, an icon for our age." When talking about the intersection of prayer, mercy, concrete acts of charity and peacemaking, Mother Teresa was Pope Francis' go-to reference. In one of his early morning homilies in November, Pope Francis spoke about war and about how, by the way they live their lives, many people promote hatred rather than peace and selling weapons rather than sowing love. "While weapons traffickers do their work, there are poor peacemakers who give their lives to help one person, then another and another and another," the pope said. Mother Teresa was clearly one of the peacemakers, he added. "With cynicism, the powerful might say, 'But what did that woman accomplish? She spent her life helping people die,'" Pope Francis said, noting that the cynics do not realize that Mother Teresa understood the path to peace and they do not. A much longer papal reflection on lessons from the life of Mother Teresa was published in July; Pope Francis wrote the preface to an Italian publisher's book of talks Mother Teresa gave in Milan in 1973. Mother Teresa's life showed the centrality of prayer, charity, mercy in action, family and youth, Pope Francis wrote. "Mother Teresa untiringly invites us to draw from the source of love: Jesus crucified and risen, present in the sacrament of the Eucharist," the pope wrote. She began each day with Mass and ended each day with eucharistic adoration, which made it possible "to transform her work into prayer." Her prayer led her to the extreme edges of society—the peripheries—recognizing the poor and the marginalized as her brothers and sisters and offering them compassion, he said. The little nun in the blue-trimmed white sari teaches people that "feeling compassion is possible only when my heart embraces the needs and wounds of the other," witnessing to God's caress, the pope wrote. The Gospel tells people they will be judged at the end of time for how they fed the hungry, clothed the naked and cared for others in need, he said. "Mother Teresa made this page of the Gospel the guide for her life and the path to her holiness—and it can be for us, as well." Pope Francis also noted in the book that, from her experience ministering to the rejected, Mother Teresa knew and constantly emphasized the importance of family and family prayer. Home, he said, is the place people learn "to smile, to forgive, to welcome, to sacrifice for one another, to give without demanding anything in return, to pray and suffer together, to rejoice and help each other." And, in a message to young people at the end of the preface, Pope Francis said, "Fly high like the eagle that is the symbol of Mother Teresa's country of origin," Albania. "Do not lose hope, do not let anyone rob you of your future, which is in your hands. Remain in the Lord and love him like God loves you; be builders of bridges that break down the logic of division, rejection and fear of others, and put yourselves at the service of the poor." Pope Francis also referred, in passing, to Blessed Teresa in his 2013 apostolic exhortation, "Evangelii Gaudium," on the proclamation of the Gospel in the modern world. Asserting the right and obligation of Christians to express publicly their opinions on political and social issues in order to promote the common good, the pope wrote: "Who would claim to lock up in a church and silence the message of St. Francis of Assisi or Blessed Teresa of Calcutta? They themselves would have found this unacceptable. An authentic faith—which is never comfortable or completely personal—always involves a deep desire to change the world, to transmit values, to leave this earth somehow better that we found it." In April, flying back to Rome from Lesbos, Greece, with 12 Syrian refugees, Pope Francis was asked what difference his visit to a refugee camp and his hosting refugees could make. "I am going to plagiarize. I'll answer with a phrase that is not mine," he told reporters traveling with him. 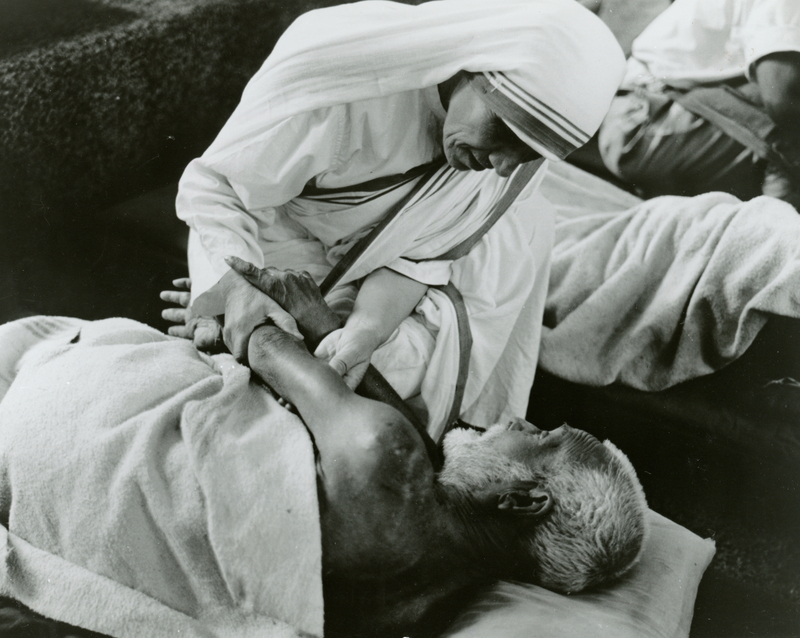 "The same question was asked of Mother Teresa: 'All this effort, all this work, only to help people to die. ... What you are doing is useless! The sea is so great!' Mother Teresa answered: 'It is a drop of water in the sea! But after this drop of water the sea will not be the same!' That is how I would respond. It is a small gesture, but one of those small gestures that we—everyone, men and women—must make to reach out to those in need."